During Fulbright orientation in Bandung, ETAs were presented with various classroom scenarios that described the amount of students, materials provided, and general classroom conditions they would face. Then, ETAs were given a particular challenge ranging from an unruly group of students to extreme heat which interfered with instruction. While I fully expected to encounter at least one of the listed challenges, I didn’t think it would happen so quickly. In my first week of teaching, I experienced my first crisis in school. When I arrived, the teachers’ room was filled with a sense of anxiety, which they clearly wanted to keep from me. In a mix of Malay and Indonesian, one word kept reoccurring that I didn’t understand, pingsan. After ruling out that they were not in fact discussing bananas, pisang, I realized that some sort of health event had happened to a student at SMKN 5. I assumed that this was a singular incident, in which one student was presumably sick, and had probably collapsed or fainted. However, when I arrived at my classroom I was quickly told that I would not be teaching today, nor Thursday, nor Friday. It was entirely possible that I would not be teaching next week too. My teachers were very vague in giving a reason for this closure of school, citing general health issues. I assumed it was due to the smog, so I went to a local coffee shop to practice my Bahasa and better understand the situation. According to the local news, Tribun Pontianak, a total of fourteen students had smog-related health problems that had resulted in at least one hospitalization . This singular event encompasses many of the challenges Kalimantan, as well as the rest of the developing world, faces as it tries to modernize and fully enter the global economy. While Pontianak has many features of a developed city–port facilities, a manufacturing base, and relatively modern infrastructure–it still practices archaic agricultural methods. The slash and burn model of agricultural development seeks to boost crop yields by destroying forests in order to enrich poor soil. This short-sighted technique has had devastating consequences for Pontianak as a whole. The ubiquitous smog of Pontianak. Smog dominates the dry season in Pontianak as farmers seek to prepare soil for planting season. As a result, smoke pours into the city and harms its citizens. Because of global warming, the wet season is delayed each year. Coupled with this year’s El Niño weather pattern, the dry season is expected to last even longer, and thus exacerbate the already poor conditions. At the coffee shop, talk of smog is equivalent to discussing the weather in the US. When the conversation slows and people grasp for conversation, everyone reverts to lamenting the smog and wishing for rain. However, there is a certain apathetic tone to the conversation. The caffeinated men have accepted the continuation of smog because farmers lack the skills and means to produce crops in a different manner. Currently, Indonesia is caught in a developmental trap, in which some aspects of life have materially improved, while others remain the same. There is talk of governmental policy, as Jokowi evidently seeks to enforce existing regulations on smog, but they seem distant and ineffective. This malaise towards smog is emblematic of Indonesia’s dilemma. In a nation of countless islands, ethnicities, and languages, the national ideology of Pancasila seems far-fetched. The fact that Pancasila derives from the two Javanese words, panca- five, and sila- principles, speaks to the attempted hegemony imposed on Indonesia’ far-flung cities. Put simply, the policymaking in Jakarta appears irrelevant to many citizens in Pontianak, a seemingly world away from the capital. The inability to impose regulations from the top embodies the inherent challenge to governing Indonesia, and smog is the visible, if not tangible, result. An official visit from President Widodo will not change the issues facing many of Pontianak’s farmers. For now, the citizens of Pontianak simply wait for the rain. 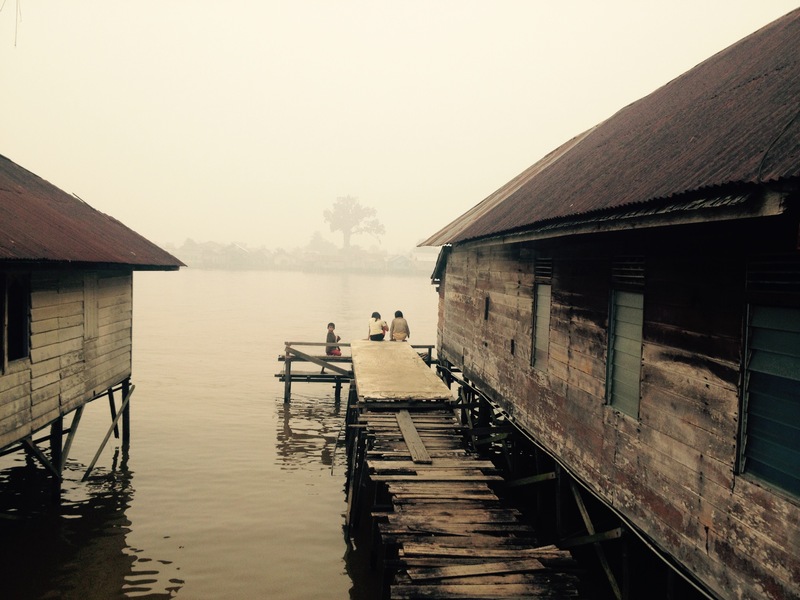 As a newcomer to Pontianak, this experience has been enlightening in many ways. At home, I often took for granted the cohesiveness of our nation. The agricultural system is so removed from my daily life that my greatest concern in regards to food is making time to stop by the supermarket. The politics of food are largely removed from my life. In addition to this, discovering that an event inside of my classroom directly represented a nationwide crisis was alarming. I knew that living in a foreign country would expose me to a new set of challenges, but I did not anticipate this level of immediacy. The smog influences the day-to-day living of my students whom I care about and want to see succeed. More selfishly, the smog has an immediate effect upon me, as my lungs ache and the ability to leave my small room is reliant on the conditions outside. School finally resumed the next Monday. During the weekly flag raising ceremony, students again collapsed one-by-one and were carried off by nurse’s aides. Soon, the yellow veiled women were scurrying all over the school’s courtyard, ushering boys and girls to the clinic. Meanwhile, the police officer continued reading Pancasila, the teachers stood resolutely, and I nervously watched. From Pontianak, to Jakarta, to all of Southeast Asia, smog is ubiquitous. It is emblematic of the desire for a better life and the struggle to maintain some semblance of normalcy. Like everyone else, I too will pray for rain. Sean Driscoll is currently a Fulbright English Teaching Assistant in Pontianak, Kalimantan Barat. He is a recent graduate of the University of Miami. When he’s not teaching, he enjoys diving, fishing, and trying all the Indonesian food his stomach can handle. Pingback: Boating in Borneo: A Ride on the Wild Side – Where in the world is Kelly?